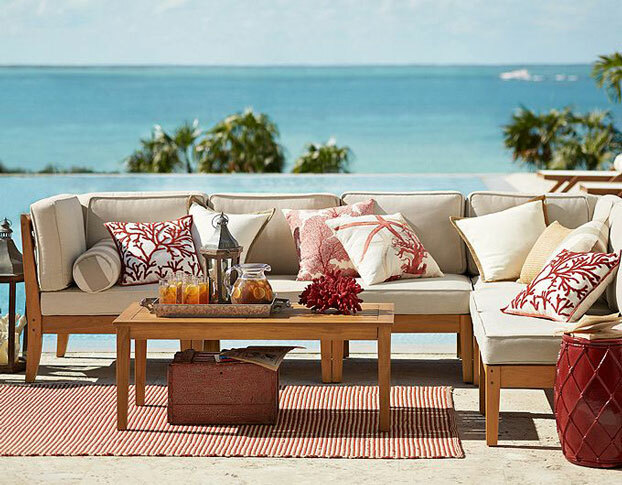 Choosing expertly crafted furnishings designed to withstand both rain and shine is key to creating an outdoor space that’s stylish, comfortable and enduring. 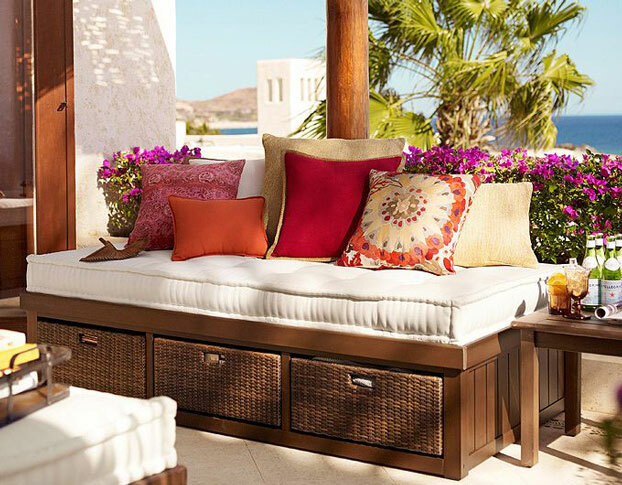 One of our favorite things about hardwood outdoor furniture is the warm, rustic patina that it develops over time. 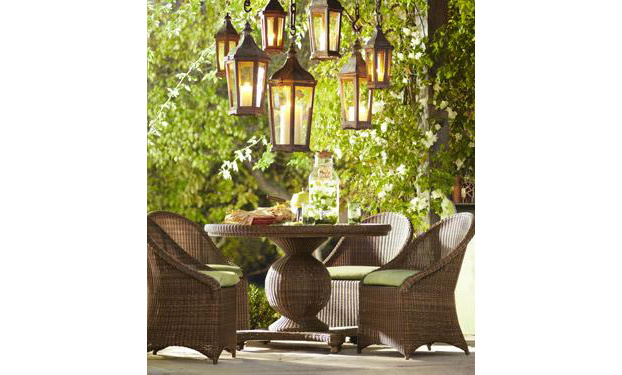 With a cluster of lanterns suspended overhead, this patio is a magical setting for twilight meals. The table’s pedestal base has an exaggerated globe shape that makes it a striking focal point, and the chairs’ hoop backs and deep aprons evoke vintage porch chairs. 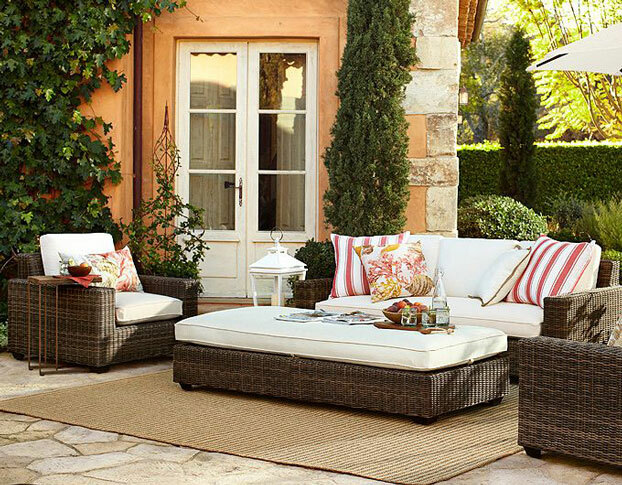 Both are wrapped with all-weather wicker that’s textural and maintenance-free. 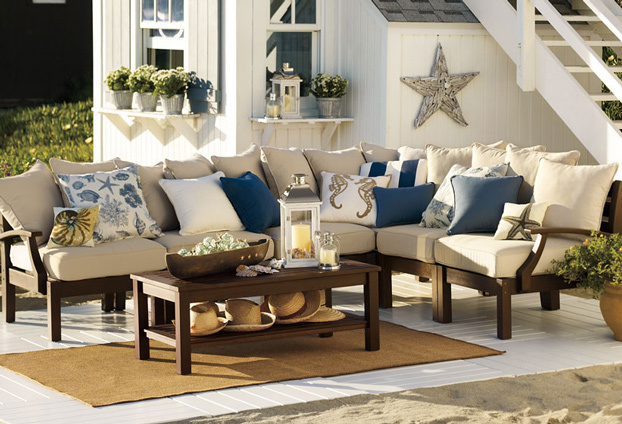 Thick seat cushions make the chairs a comfortable place to linger. The soft, flickering light and eclectic character of candles brings pure drama to the outdoors. Create a tabletop arrangement with candles for your outdoor dinner party or use string lanterns to create an intimate space. Vibrant color and indoor-quality furnishings make this space dazzle. The sofa’s white upholstery lays the foundation for a group of mostly red pillows, which do much of the design work here, providing coziness and striking style. The sofa and ottomans are arranged to encourage conversation, and occasional tables display drinks and snacks. 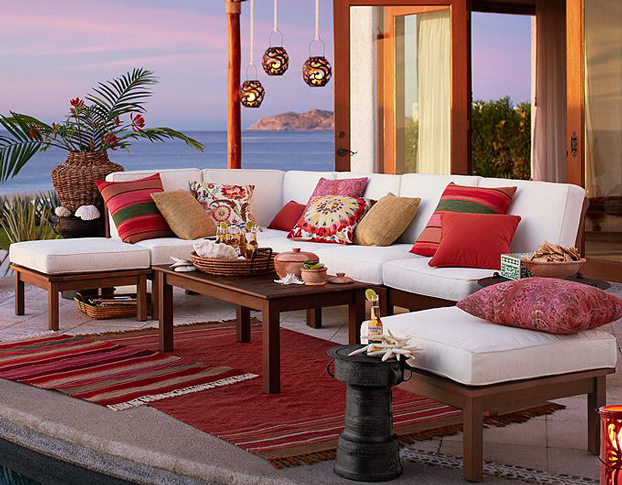 Flickering hanging lanterns draw the eye up to the knockout view. 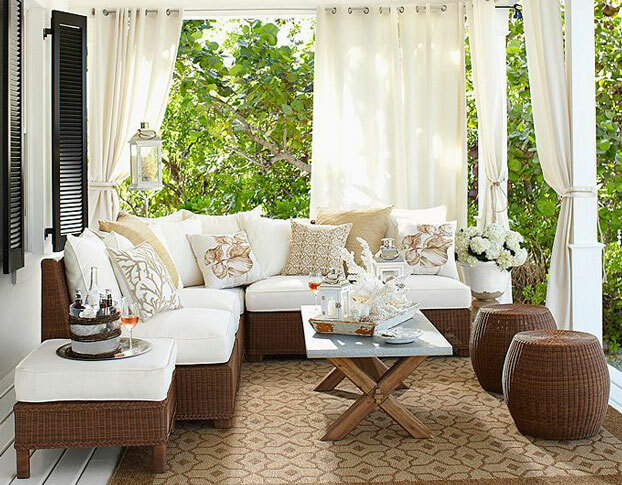 A relaxing stage is set when small and large prints are mixed in one neutral color. 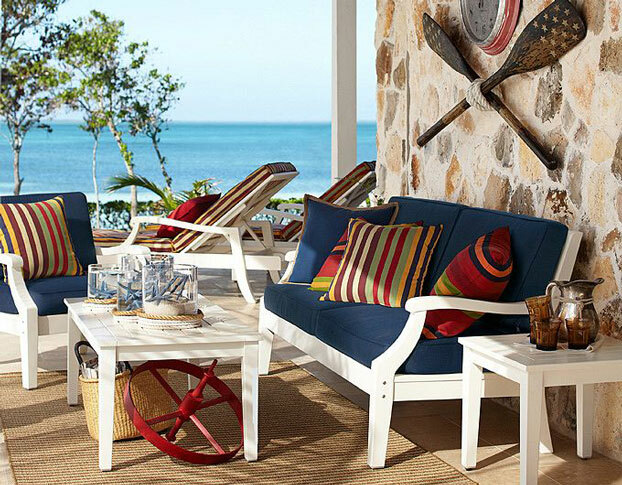 Colors found in a surrounding outdoor space set a beautiful scheme when reflected in a detailed print and a simple stripe. 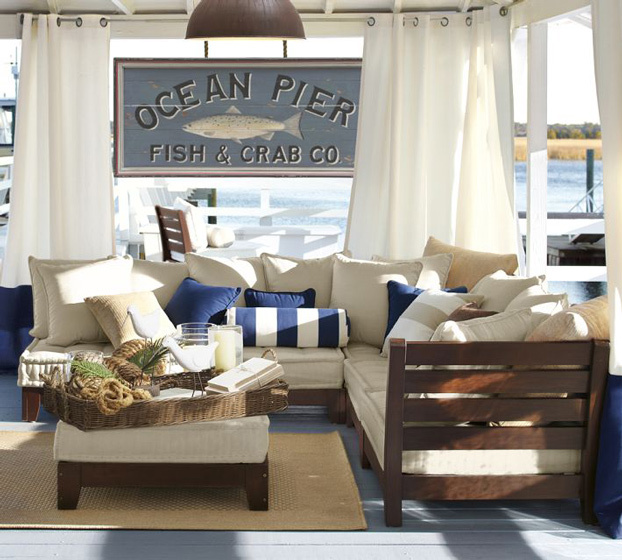 The casual low design of Chesapeake Low Platform collection lends itself perfectly to relaxing outdoors. Each piece is expertly crafted of moisture-resistant eucalyptus and finished with our long-wearing polyurethane stain, which acts as a protective coat to maintain the surface beauty and integrity. 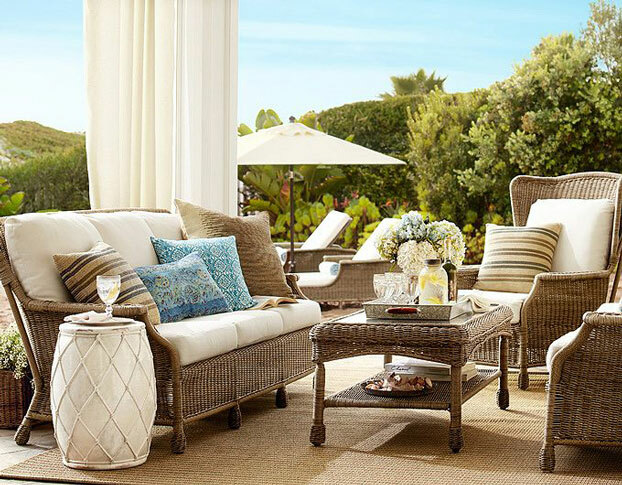 You can find these outdoor patio furniture on Pottery Barn.